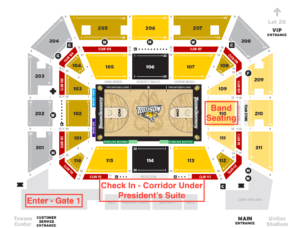 We would like to invite any Towson Alumni to play with the Pep Band at the Men’s game on January 5th, 2018. If you wish to participate, please fill out the following interest form so that we know you are coming. Also, please look below for more details regarding that day’s activities. If lot 21 is full, you should park in lot 13 or lot 14. Enter Through *Gate 1* – There will be a SECU staff member there to greet you. Give them your name and tell them you are with the Pep Band, your admission will be free. Any player on the pep band alumni list is allowed to bring one guest free of charge. That one guest needs to share your name at Gate 1 (with or without you being there) and will also be allowed in. If you want to bring any additional guest, they can also use your name but will be charged $5 per ticket. At this time, navigate to the corridor below the president’s suite (court level). You will then check-in, pay your fee if needed, and check-out an instrument if needed. What years were you in the band? To participate, we kindly ask you to contribute $15 dollars to the TU Foundation. This cost will cover your t-shirt and a small reception after the game. Please mail checks to the address below. If you can not mail a check at this time, please bring one with you to the game. Also, please indicate below how you intend to pay. Check Made Out To: TU Foundation - Mail To: Department of Music/Marching Band - 8000 York Road - Towson Maryland, 21252 - Indicate "TUMB Alumni" on the "for" line. Take the Alumni Membership Survey Here! 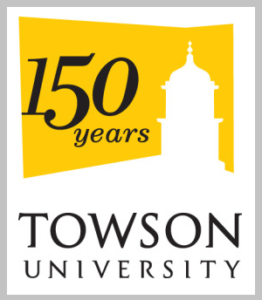 In May of 2015, Towson University will begin a 13-month long celebration of its 150th Anniversary. Many events, presentations, and creative works will happen over the next year that will highlight the rich and diverse history of the university, including a Kick-Off Celebration and Legacy Walk Ribbon Cutting, monthly Visiting Scholars, and in July a community celebration! Though the festivities are still being planned the celebration will continue for many years to come. Towson University has gone through many transformations; from name changes to an ever-expanding campus. There is an old-side of campus consisting of the original Towson University building; Stephens Hall, as well as Newell and Richmond Halls. The campus sweeps through to a new-campus highlighted by the College for Liberal Arts and the West Village Commons and dormitories. Each part of campus highlights Towson University’s growth through 150 years. With nearly 22,000 students, Towson University is among the largest public universities in Maryland. Towson combines research-based learning with practical application, and its many interdisciplinary partnerships with public and private organizations throughout Maryland provide opportunities for research, internships and jobs. Towson University has come a long way in its history.